Pattern Release :: Give a hoot! Hey there — Amy here. It's been awhile since any of the girls at Pimp Stitch released a new pattern and I think it's time! I tried to incorporate my pattern into a project this time to give you some ideas of what you can do with your finished embroidery. I used one of the owls from my new Give a hoot! 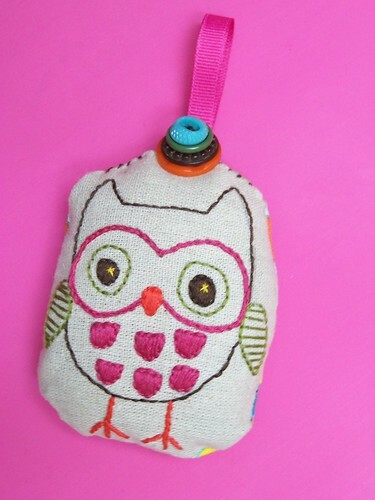 collection, plus Tamie's tutorial on how to make an embroidered plushie to make this cute little owl ornament. The only change I made was that I made a loop with a piece of ribbon then sewed the ribbon in between the two pieces of fabric on top. I know we're way past Christmas but you can hang him anywhere you like. Hey there, it's Amy here again. I recently became a fan of Helen Dardik. I purchased her Coffee with my Owl print the moment I saw it and have been an avid reader of her blog ever since. So...when I saw her post with the most adorable free holiday pattern, you know I had to share. Check out the orange you lucky! blog for free downloadable pattern and instructions. Rachel Hobson from CRAFT blog directs us towards some free embroidery patterns, available over at Meet Me At Mikes. Aren't they adorable? The Holidays are almost here! Are we panicking yet? These felted super-spankin' free ornament patterns are from Berroco.com. Don't knit? They would still look adorable made from felt or even paper. These are the same folks that brought us the cute mini sweater ornament craze of 2007. And they have a new line of free mini sweater patterns for 2008. Anybody out there want to volunteer to make me the whole collection?? Anybody? Anybody? Bueller? Tamie is bringing on the stitch with two new patterns this week. First is Sleep Songs, you may remember this sleepy owl from her Embroidered Plushie Tutorial from last week. Now you can make your own following the easy instructions! Next, meet the residents of Willow Farms. There's The Cluckster(rooster), Squirrely Nuts(squirrel), El Puerco(pig) and Ninja Beaver! Head over to Tamie's Shop to check them all out! Two new patterns from our girlie Lauren! Dutch Farm and Modern Blooms. Don't be a bummer and miss out on these amazing pattern collections!!! With Dutch Farm, you have a vintage Scandinavian style and Modern Blooms is ethereal and beautifully modern. You won't be able to resist your urge to stitch. Amy has two new patterns this week! Both are fresh fun with a vintage edge. First up we have The Vintage Flora based on vintage enamal flowers! There are four flower designs and two sets of leaves to choose from. Next is Home Sweet Home...how sweet it is! A delightful woodland scene with a mushroom cottage, tree swing and friendly snail neighbor. So skip on over to Amy's shop and see what she has in her shop for you.